A Fall In Knife Attacks On Israelis, Amid A Shifting Palestinian Mood : Parallels Seven months after it began, a wave of Palestinian stabbing attacks against Israelis appears to be slowing. 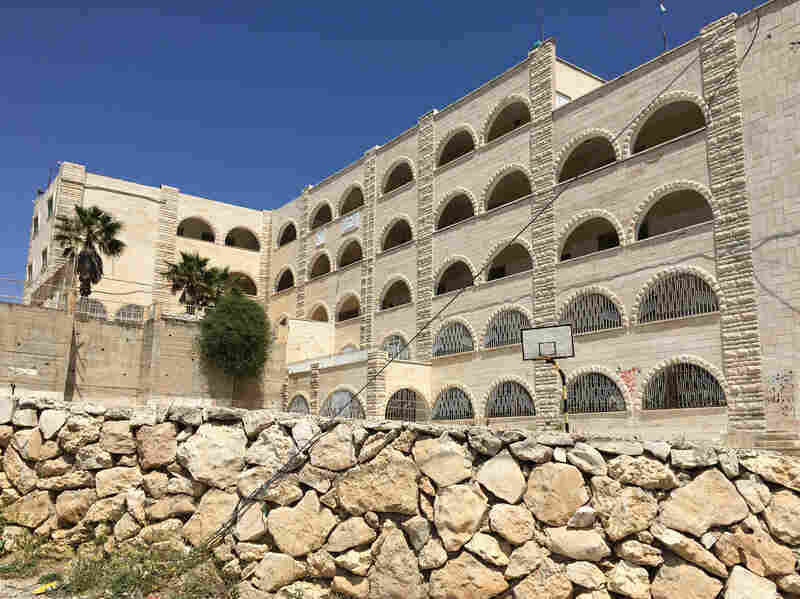 Some Palestinian schools say they have been trying to combat the violence. 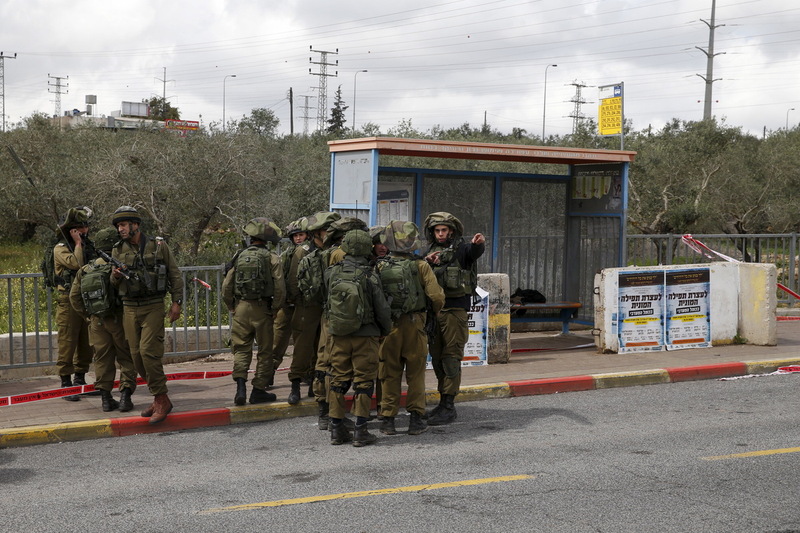 Israeli soldiers gather near where the Israeli military said two Palestinians stabbed and wounded an Israeli woman outside the Jewish settlement of Ariel in the West Bank in March 2016. The Palestinian attackers were shot and killed in response. More than seven months after it began, a wave of Palestinian stabbing attacks against Israelis appears to be slowing. Israeli military officials say Palestinian attacks continue, but the number of attempted attacks has dropped significantly. Notably, they say, stabbing attacks by teenagers acting alone have gone down. As that downward arc took shape, Palestinian Authority President Mahmoud Abbas went on Israeli television. Speaking on the Channel Two program "Uvda," or "Fact," in late March, Abbas made a remarkable claim. "Our security guys go inside schools searching students' bags for knives," he told the Israeli interviewer in Arabic. "We found 70 pupils, boys and girls, carrying knives in one school." Abbas went on to say Palestinian security officers talked with the students. "We told them this is wrong. We do not want you to kill and get killed. We want you to live and the others to live too," Abbas said. This was remarkable for two reasons. First, because it's politically very delicate for Abbas to acknowledge his security forces do things that some Palestinians see as following Israeli orders. Second, the stabbing attacks against Israelis, which began in October and for several months continued almost daily, were initially popular among many Palestinians. They said this was a legitimate response to Israel's military occupation. Abbas would not have risked making such statements earlier, says Palestinian political analyst and pollster Ghassan Khatib. "Only when this phenomenon became less and less popular," he says. "He wouldn't have said it in the first month, because it could have been much more damaging to the public opinion." Abbas' comment was also notable because numerous Palestinian politicians and security officials could not or would not verify his statement. Khatib himself cautioned that he did not take the specific claim of finding 70 knives in one school literally, citing past examples of illustrative speech by Palestinian officials that were misinterpreted in the West. No one could confirm that Palestinian security forces have searched students' bags. But according to some accounts, Palestinian police have warned students that committing attacks could lead to their own deaths. Since Oct. 1, Israeli figures show more than 30 Israelis and two Americans were killed by Palestinians. According to Palestinian health officials and U.N. reporting, more than 200 Palestinians have been killed by Israeli forces since then. Some were shot during clashes with Israeli forces. But Israel says most Palestinians were killed while carrying out attacks against Israelis. Many Palestinians believe Israeli forces fatally shot Palestinians who were not intending to attack or who could have been otherwise subdued. Khatib believes the high number of Palestinian casualties during the wave of heightened violence has led to lower public support for stabbings, which recent surveys indicate. "I think that the public at large is not happy with this phenomenon. It's a waste of souls with little return, if any," Khatib says. Israeli military officials credit increased arrests and other measures for reduced attacks. Two students from this boys' high school in the West Bank Palestinian town of Sair were killed in the wave of violence that started last October. At a boys' high school in Sair, a Palestinian town in the West Bank where more than a dozen young men were killed by Israeli forces since last fall, teachers and administrators say they have been trying to keep their students focused on studies, as well as manage grief and anger that arose with the wave of violence. Two of those killed were students at this school. 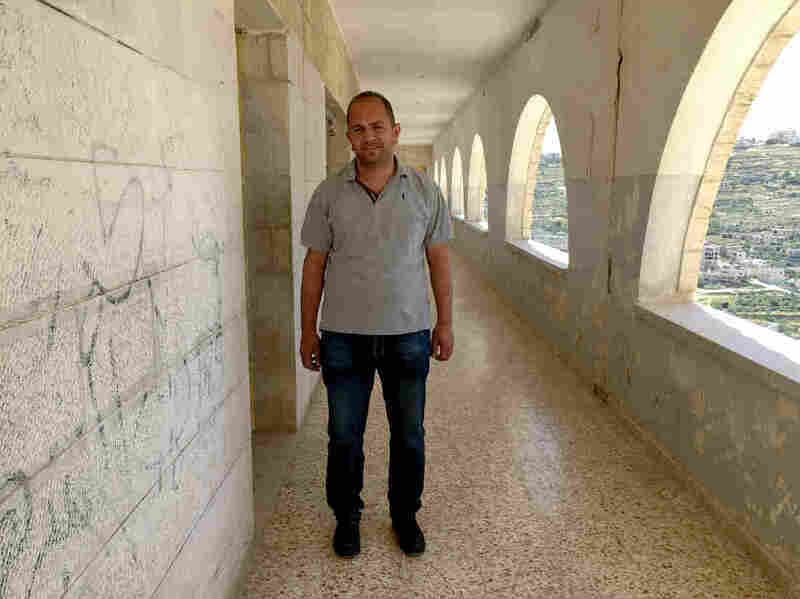 One was killed last November in a clash with soldiers after the funeral of his cousin — who had also been killed by Israeli undercover troops in an arrest raid in a hospital. The other was shot in January during an attempted stabbing, according to the Israeli military. School administrators were nervous to speak publicly. The principal selected five seniors to answer questions. One of them, Mohammad Frukh, was friends with both of the students who were killed. "The intensity of shock and grief has been very difficult," Frukh says. "Not only on me but on the whole village." But he says with help from his teachers, he is focusing on school and final exams. "I understand now we can face the Israeli occupation through education," Frukh says. The school's psychology teacher and counselor, Areef Miri, has taken the lead in helping students cope. He says he has done a lot of one-on-one "venting" sessions, encouraging students to share feelings of anger. He has taken groups of students to visit the families of their former classmates as well as the graves. He's run sports tournaments in the deceased students' honor. Areef Miri is a psychology teacher and counselor at the boys' school in Sair. He has taken the lead in helping students cope and encourages them to vent their feelings. Miri says he's also offered students practical advice on how to behave around Israeli soldiers. "To protect yourselves from getting killed, getting arrested or injured, follow these rules," Miri tells them. "Cross checkpoints in groups. Never answer the phone as you're passing. Show your hands." Palestinian security forces came to the school to help with these conversations, school officials say. 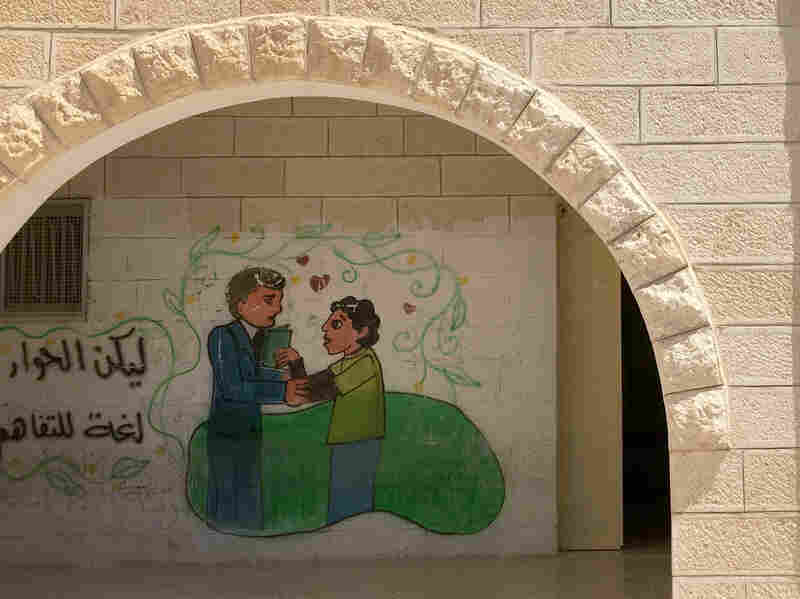 A mural on the wall of the boys' high school in Sair, a Palestinian town in the West Bank. More than a dozen young men from Sair were killed by Israeli forces since last fall, including during attacks on Israelis. But teachers say they cannot influence social media or Palestinian TV. The Al-Aqsa channel, run by the militant group Hamas, frequently replays video composites of Israeli violence against Palestinians and memorials honoring attackers. Watching the Al-Aqsa channel at home in a West Bank refugee camp, Jihad Khatari, a 22-year-old Palestinian who has a job installing windows, gets riled up. "I get very upset, frustrated, furious." Khatari says. He sometimes participates in demonstrations against Israel's military presence in the West Bank. "I feel personally inside like I want to go out and do something." While support for knife attacks has appeared to drop, one recent poll also found more than half of young West Bank Palestinians favored continuing the current uprising generally. They were split on whether the violence might intensify, and whether it will aid Palestinian interests in the end.